GENEVA, Switzerland -- UEFA president Michel Platini and a UEFA delegation will receive a progress report on UEFA EURO 2012 preparations in Ukraine when they make a trip to the co-host nation this week. 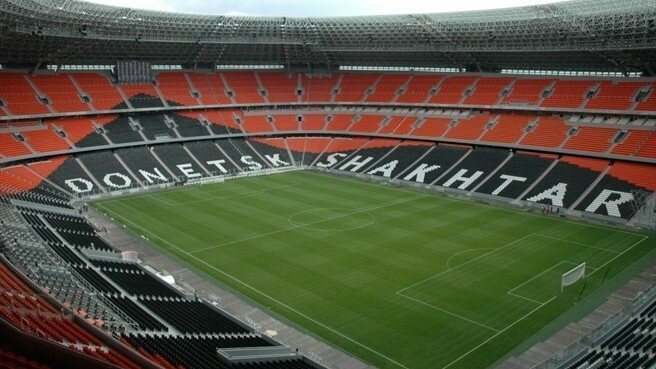 UEFA EURO 2012 venue Donetsk will feature on the itinerary of the UEFA president. UEFA president Michel Platini and a UEFA delegation visit UEFA EURO 2012 co-hosts Ukraine on Wednesday and Thursday for an update on preparations for the EURO final round in two years' time. Mr Platini will be accompanied by UEFA vice-president Marios N Lefkaritis and senior UEFA administration members on the trip to the four host cities in Ukraine – Donetsk, Kharkiv, Kiev and Lviv. The welcoming Ukrainian delegation will include representatives of the Ukrainian government, among them the Ukrainian vice-prime minister Borys Kolesnikov, Football Federation of Ukraine (FFU) president Grigoriy Surkis and Ukraine 2012 tournament director Markiyan Lubkivskyi. An update will be given on the state of preparations in the host cities, and visits will take place to all four stadiums that will stage matches at UEFA EURO 2102. On Thursday, Mr Platini will meet the president of Ukraine, Viktor Yanukovych, in Kiev. Ukraine are co-hosting the final round with Poland from 8 June to 1 July 2012. It will be the third time that the final tournament is jointly hosted by two countries – after Belgium/Netherlands in 2000 and Austria/Switzerland in 2008. Gdansk, Poznan, Warsaw and Wroclaw are the four Polish host cities for the 2012 tournament.